Two outside liners separated by small I-beam formed plastic. 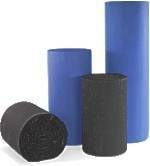 Standard profile is manufactured from high-density polyethylene and polypropylene plastic. Profile board is available in a variety of thickness and colors including many stock and custom colors, and translucent white. These sheets come in 2mm, 4mm, 6mm, 8mm & 10mm they also come in 16 different colors. Similar in design to corrugated fiberboard, with two outside liners fused to a fluted center. Standard laminate is high density polyethylene plastic available with special additives. This is a much stronger Plastic corrugated sheet, that can be made in different strengths at the same thickness. Single Face corrugated plastic rolls are available from our laminate process. It can be produced in pads, sheets or rolls. These rolls are made from 100% recyclable plastic. The perfect choice for any construction site or for protecting your valuables. The best protection for shipping and packaging high end items such as furniture, lamps, lights, glass, etc... Simply wrap the plastic corrugated roll around any item, for long lasting protection. Can be reused over and over again. Stronger then paper corrugated rolls, weather resistant, water proof. 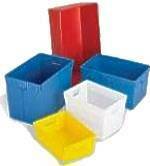 Plastic Corrugated Bins, Boxes, Containers and Accessories can be used to transport and store your products within your facility and/or to transport them between different facilities. Containers made in the right color can have a positive effect on the people using them. In addition, color-coded containers can be useful in identifying particular classes of parts and in locating "hot" items quickly. CorrugatedPlastics.Net offers a spectrum of standard colors and the capability of meeting your exact color needs. Please note: Not all items are available in all colors. Completely reusable, extremely long life, durable. Corrugated Plastic Sheets have the following properties. Corrugated Plastic Sheets CAN have the following options. Comes in 2mm, 4mm, 6mm, 8mm, & 10mm thickness. Available in 8 different Strengths. Can be made for die-cut. Can be sonic or heat welded. Resists a wide range of chemicals, grease and dirt. Can be produced with a non-skid coating on one side.